Surprisingly, the history of hearing aids spans across multiple centuries and has resulted in the improved hearing of millions of people. For as long as people have struggled to hear, there have been those looking for ways to restore proper hearing. From the 1800's to today, there has been a slow but steady march from bulky, mechanical devices to the miniaturized, ultra-high-tech hearing aids of today. This is the evolution of audiological technology. Let’s take a quick trip down memory lane to explore the history of hearing aids. The earliest hearing aids, called ear trumpets, resembled what might be described as "reverse megaphones". If you have seen a cheerleader shouting into one of these conical amplifiers, you may have wondered what it would be like if the sound came through the large end and was heard in the smaller end. The ear trumpet of the 17th century worked by funneling sound through the broad end of the trumpet to end up at smaller end placed in the ear, thus keeping sound from escaping. The result was amplification, although the sound quality could be tinny or staticky. The history of hearing aids advanced significantly after the invention of the telephone. While not terribly portable, these devices were a major improvement over the ear trumpets. Telephone transmitters and vacuum tubes were common components of these bulky but moderately effective aids. Running on electric power, these devices began gaining in popularity in the 1930s and 1940s. The invention of the transistor in 1948 ended the need for bulky vacuum tubes and allowed hearing aids to become extremely portable while at the same time offering greater clarity in sound amplification. This improvement in audio quality, accompanied by less visibility and greater portability, produced even greater enthusiasm for hearing aids. With the creation of the microprocessor and the advent of digital technology, today's hearing aids reach a level the creators of the first aids could have never imagined. Many of the improvements in performance are the result of advances in digital technology. Clean up static on bands that are "dirty"
This digital analysis, improvement, and reproduction of sound happens virtually instantaneously. This means there is no lag from the time the hearing aid picks up a sound to the time it get transmitted to the ear of the hearer. A hearing aid differs from many health products in that it requires precise calibration to work at an optimal level. While certain measurements of the ear and ear canal are required for fitting of the device itself, audiological testing must be performed to tune the aid for the specific wearer. 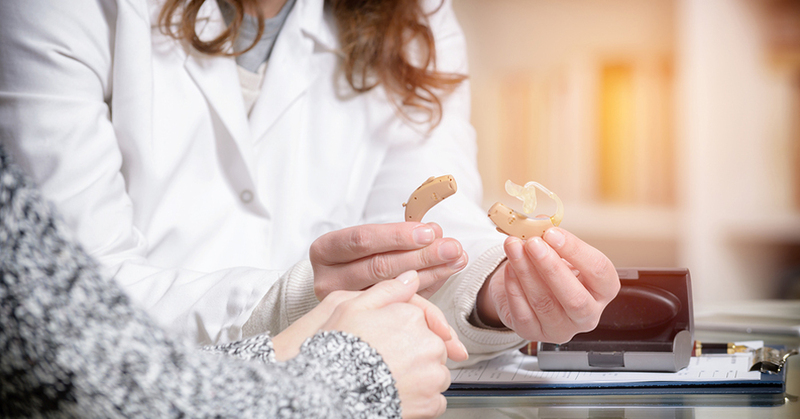 At North Shore Hearing, our licensed audiologists are experienced with all the latest hearing aids and the testing that shows the severity, type, and configuration of our patients hearing impairments. After testing, we can break down all aspects of the test results and explain the various hearing aid options and how they can dramatically improve the hearing loss. The history of hearing aids has shown innovation and steady improvement in the quality of hearing aids, confirming that today’s hearing aids of today are phenomenal pieces of technology. It also highlights the promise for the future of hearing aids and excitement over where these critical devices are going. With innovations like the Oticon OPN hearing aids bolstered by the innovative If This Then That (IFTTT) network, there are a growing number of devices utilizing the Internet to provide a more streamlined and enhanced experience. In addition, you can also expect to see more innovations surrounding rechargeable hearing aids, potential fuel cell applications, and even elements of mind-controlled hearing aids. As your local team of audiologists, the experts at North Shore Hearing P.C. want to help you hear and experience life better. We’re proud to offer some of the innovative and most cutting-edge hearing aids available on the market designed to accommodate virtually any lifestyle, including custom molds, hearing aids for musicians, and hearing aids for swimmers. If you have a hearing issue or would simply like to get your hearing tested for any reason, we offer free hearing screenings. Contact North Shore Hearing P.C. today.